In December, we had the pleasure to host a group of officials and staff of non-profit organizations from Kentucky, including Kentucky Housing Corporation Executive Director Edwin King, to visit a recently completed development in Columbus, Career Gateway Homes, which is a great example of the linkage of housing and services. This innovative workforce housing model was developed by the NRP Group LLC (a for-profit developer), in collaboration with Community Development for All People (a neighborhood community development corporation). Career Gateway Homes is located on over two acres that was previously occupied by a vacant elementary school. A total of 58 new residences were constructed on the urban infill site in the form of a 44-unit, three-story elevator-served apartment building and 14 three-story townhomes with attached garages. The project provides over 3,200 square feet of common space including a community room for gatherings, a kitchenette, computers, and laundry rooms with 24-hour access. Additionally, Career Gateway Homes offers a training center to prepare residents to be future employees and to fill the growing needs of the companies in the area. The development team created relationships with local employers to offer training programs that are tailored to the needs of the residents and assist in their employability. Specifically, Career Gateway Homes has created a strategic partnership with Nationwide Children's Hospital, as part of its Healthy Neighborhoods, Healthy Families initiative to provide high quality housing, training and job placement for area residents - all in close proximity to the hospital and its more than 10,000 jobs. Workforce training is also offered in conjunction with Columbus State Community College, which provides short term customized courses for in-demand occupations to residents who meet employer approved criteria. The development was completed and leased up in summer 2017. Initial trainings and classes have begun. OHFA will monitor the outcomes in efforts to inform other organizations who wish to replicate this model in other parts of the state and outside of Ohio. We will also report results on our website OhioHome.org. In the meantime, we will continue to innovate and adapt our process based on emerging theories and best practices to better integrate the workforce and housing sectors. How can your community collaborate to be healthier and more successful? What can your community do to repurpose areas with vacant buildings, increase needed affordable housing, and help community residents learn skills that make them employable by local employers? Sean Thomas, guest blogger, serves as the executive director of the Ohio Housing Finance Agency (OHFA), which facilitates the development, rehabilitation, and financing of low- to moderate-income housing. This agency provides programs to help first-time homebuyers, renters, senior citizens, and others find quality, affordable housing. To learn more, visit www.OhioHome.org. 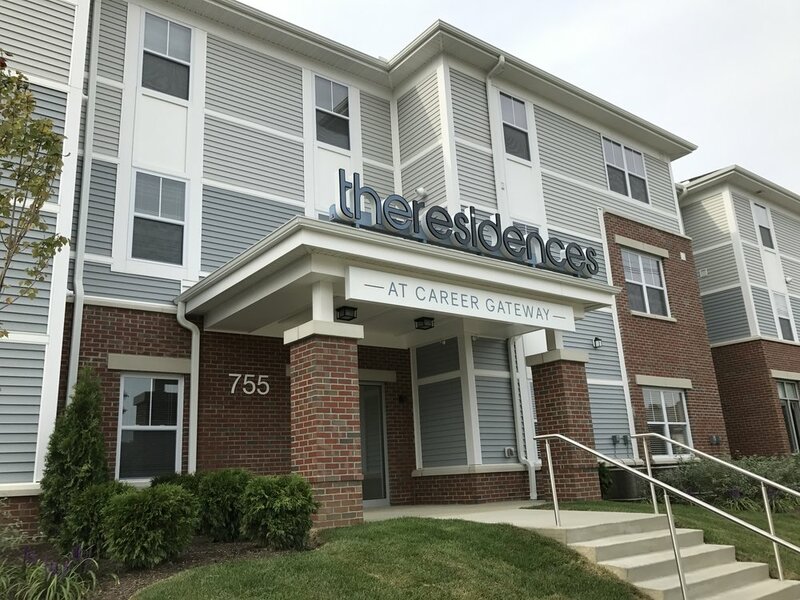 The Residences at Career Gateway are located in the Southside of Columbus, Ohio. For more information about this community, visit their website at www.ResidencesatCareeGateway.com.